The technical standards underlying the Internet protocol suite and its constituent protocols are maintained by the Internet Engineering Task Force (IETF). The Internet protocol suite predates the OSI model, a more comprehensive reference framework for general networking systems. The Internet protocol suite resulted from research and development conducted by the Defense Advanced Research Projects Agency (DARPA) in the late 1960s. After initiating the pioneering ARPANET in 1969, DARPA started work on a number of other data transmission technologies. In 1972, Robert E. Kahn joined the DARPA Information Processing Technology Office, where he worked on both satellite packet networks and ground-based radio packet networks, and recognized the value of being able to communicate across both. In the spring of 1973, Vinton Cerf, who helped develop the existing ARPANET Network Control Program (NCP) protocol, joined Kahn to work on open-architecture interconnection models with the goal of designing the next protocol generation for the ARPANET. In 1975, a two-network TCP/IP communications test was performed between Stanford and University College London. In November 1977, a three-network TCP/IP test was conducted between sites in the US, the UK, and Norway. Several other TCP/IP prototypes were developed at multiple research centers between 1978 and 1983. In March 1982, the US Department of Defense declared TCP/IP as the standard for all military computer networking. In the same year, Peter T. Kirstein's research group at University College London adopted the protocol. The migration of the ARPANET to TCP/IP was officially completed on flag day January 1, 1983, when the new protocols were permanently activated. In 1985, the Internet Advisory Board (later Internet Architecture Board) held a three-day TCP/IP workshop for the computer industry, attended by 250 vendor representatives, promoting the protocol and leading to its increasing commercial use. In 1985, the first Interop conference focused on network interoperability by broader adoption of TCP/IP. The conference was founded by Dan Lynch, an early Internet activist. From the beginning, large corporations, such as IBM and DEC, attended the meeting. Some of the early TCP/IP stacks were written single-handedly by a few programmers. Jay Elinsky and Oleg Vishnepolsky [ru] of IBM Research wrote TCP/IP stacks for VM/CMS and OS/2, respectively. In 1984 Donald Gillies at MIT wrote a ntcp multi-connection TCP which ran atop the IP/PacketDriver layer maintained by John Romkey at MIT in 1983-4. Romkey leveraged this TCP in 1986 when FTP Software was founded. Starting in 1985, Phil Karn created a multi-connection TCP application for ham radio systems (KA9Q TCP). The spread of TCP/IP was fueled further in June 1989, when the University of California, Berkeley agreed to place the TCP/IP code developed for BSD UNIX into the public domain. Various corporate vendors, including IBM, included this code in commercial TCP/IP software releases. Microsoft released a native TCP/IP stack in Windows 95. This event helped cement TCP/IP's dominance over other protocols on Microsoft-based networks, which included IBM Systems Network Architecture (SNA), and on other platforms such as Digital Equipment Corporation's DECnet, Open Systems Interconnection (OSI), and Xerox Network Systems (XNS). The British academic network JANET converted to TCP/IP in 1991. 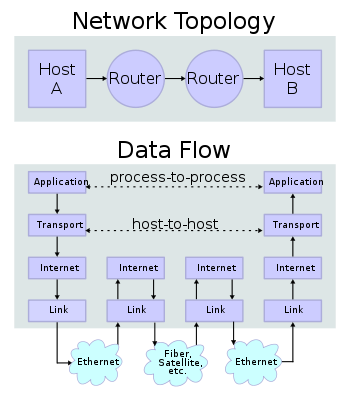 Conceptual data flow in a simple network topology of two hosts (A and B) connected by a link between their respective routers. The application on each host executes read and write operations as if the processes were directly connected to each other by some kind of data pipe. After establishment of this pipe, most details of the communication are hidden from each process, as the underlying principles of communication are implemented in the lower protocol layers. In analogy, at the transport layer the communication appears as host-to-host, without knowledge of the application data structures and the connecting routers, while at the internetworking layer, individual network boundaries are traversed at each router. Encapsulation is used to provide abstraction of protocols and services. Encapsulation is usually aligned with the division of the protocol suite into layers of general functionality. 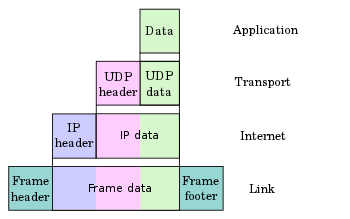 In general, an application (the highest level of the model) uses a set of protocols to send its data down the layers. The data is further encapsulated at each level. The application layer is the scope within which applications, or processes, create user data and communicate this data to other applications on another or the same host. The applications make use of the services provided by the underlying lower layers, especially the transport layer which provides reliable or unreliable pipes to other processes. The communications partners are characterized by the application architecture, such as the client-server model and peer-to-peer networking. This is the layer in which all higher-level protocols, such as SMTP, FTP, SSH, HTTP, operate. Processes are addressed via ports which essentially represent services. Forouzan, Behrouz A. (2003). TCP/IP Protocol Suite (2nd ed.). McGraw-Hill. ISBN 978-0-07-246060-5. Maufer, Thomas A. (1999). IP Fundamentals. Prentice Hall. ISBN 978-0-13-975483-8. Clark, D. (1988). The Design Philosophy of the DARPA Internet Protocols (PDF). SIGCOMM '88 Symposium Proceedings on Communications Architectures and Protocols. ACM. pp. 106–114. doi:10.1145/52324.52336. ISBN 978-0897912792. Retrieved 2011-10-16. ^ RFC 1122, Requirements for Internet Hosts – Communication Layers, R. Braden (ed. ), October 1989. ^ Crowell, William; Contos, Brian; DeRodeff, Colby (2011). Physical and Logical Security Convergence: Powered By Enterprise Security Management. Syngress. p. 99. ISBN 9780080558783. ^ Martin, Olivier (2012). The "Hidden" Prehistory of European Research Networking. Trafford Publishing. ISBN 1466938722. ^ Kirstein, Peter T. "Early experiences with the ARPANET and Internet in the UK". Department of Computer Science, Systems and Networks Research Group, University College London. Retrieved 13 April 2016. ^ Cade Metz (25 December 2012). "How the Queen of England Beat Everyone to the Internet". Wired Magazine. Archived from the original on 19 July 2014. Retrieved 27 June 2014. ^ "The Adoption of TCP/IP". clivemabey.me.uk. Retrieved 2019-02-12. ^ Jon Postel, ed. (September 1981). Internet Protocol DARPA Internet Program Protocol Specification. p. 23. doi:10.17487/RFC0791. RFC 791. ^ R. Braden, ed. (October 1989). Requirements for Internet Hosts – Communication Layers. p. 13. doi:10.17487/RFC1122. RFC 1122. ^ B. Carpenter, ed. (June 1996). Architectural Principles of the Internet. doi:10.17487/RFC1958. RFC 1958. ^ Hunt, Craig (2002). TCP/IP Network Administration (3rd ed.). O'Reilly. pp. 9–10. ISBN 9781449390785. ^ "Information processing systems – Open Systems Interconnection – Internal organization of the Network Layer", ISO 8648:1988. ^ "Information processing systems – Open Systems Interconnection – Basic Reference Model – Part 4: Management framework", ISO 7498-4:1989. ^ Comer, Douglas (1 January 2006). "Internetworking with TCP/IP: Principles, protocols, and architecture". Prentice Hall. ISBN 0-13-187671-6. Retrieved 12 September 2016 – via Google Books. ^ Kozierok, Charles M. (1 January 2005). "The TCP/IP Guide: A Comprehensive, Illustrated Internet Protocols Reference". No Starch Press. ISBN 9781593270476. Retrieved 12 September 2016 – via Google Books. ^ Stallings, William (1 January 2007). "Data and Computer Communications". Prentice Hall. ISBN 0-13-243310-9. Retrieved 12 September 2016 – via Google Books. ^ Tanenbaum, Andrew S. (1 January 2003). "Computer Networks". Prentice Hall PTR. ISBN 0-13-066102-3. Retrieved 12 September 2016 – via Google Books.